Thinking of buying a short sale property in Lusby MD, St. Leonard MD or Prince Frederick MD? Read this first! 1. Banks are not approving short sales at the contract price. Unlike 2012 and prior, the market is now increasing in many areas. The banks know this and while in the past their attitude seemed to be "even though this offer is lower than we like, the market is declining so if we don't take this, the home may be worth less 6 months from now." As a result, they had a tendancy to take lower offers. Now the opposite applies. Their thought process seems to be "the market is rising so if we hold out for more money, that's fine because the value of the home will go up." Just yesterday I had a contract fall through on a home for a buyer I represented. The listing agent and I both agreed that the comps supported a sales price of $235,000. My buyer wrote the contract for the asking price of $235,000 with 3% closing help. The bank countered back at $262,500 with no closing help! There is no way in the world the house is worth that price but the bank would not budge. My buyer took himself off the market for 60 days, only to have to start from scratch looking at other homes again. 2. 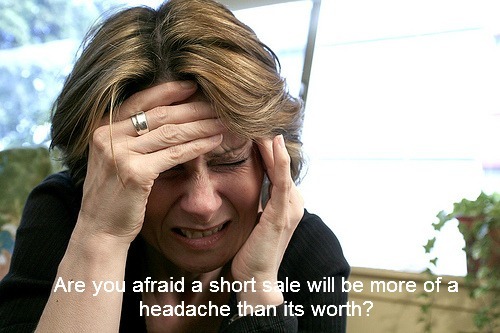 Many agents are pricing short sales too low! In most cases, banks do not approve the list price of the short sale. It is up to the listing agent to set the price at an accurate number to begin with. This is not happening in many cases, as agents are not pricing homes correctly or are intentionally pricing them too low simply to create activity and try to generate activity. To me, as a Realtor who takes great pride in my job, this is a shame. As a buyer, you have to understand that if you see a home and think "this is a great price, I need to jump on this," that it is probably too good to be true. The price is simply a suggested price and the bank is under no obligation whatsoever to approve this price. 3. The bank may counter at a price higher than your pre-approval. What happens if you are like most people and for example you are pre-approved for $300,000 and find a "steal" on a short sale at $295,000. You get excited, write an offer which is accepted by the seller for $295,000. You wait for 60-90 days only to have the bank come back and counter at $315,000. Even though the house may be worth $315,000, you cannot purchase it because you are not pre-approved for that amount. Another scenario: You were pre-qualified for $295,000 at a 4% interest rate. The bank approves the sale at $295,000 but in the time it took them to approve the short sale, interest rates have risen to 4.5%. You may not even qualify if you are flirting with homes at your maximum pre-approval amount. 4. The approval process can take up to 6 months. Is time of the essence for you? Are you going to be in a bind if you cannot move into a new home within 90 days? Keep in mind, once the bank approves the short sale, your lender will still need at least 30 days to approve your loan. Can you wait up to 6 months only to have to start from scratch and begin your search again? Many people can do this, and they are good candidates for short sales. However, if you are like most people, you cannot run the risk of waiting many months only to have the bank not approve the short sale. In the meantime, not only are you back to square one, but home prices and interests rates have potentiall risen. In summary, short sales CAN be great deals. However, you must be a good fit for a short sale purchase and you must be educated by an EXPERIENCED SHORT SALE AGENT so you understand the risks vs reward. This blog is not intended to give legal advice on short sale properties, it is simply written to make you, as a potential buyer, beware and understand the exact process you may be dealing with. Only you can decide if a short sale purchase is for you so contact me and we can discuss your individual situation of you are ready to buy a home. If you are thinking of selling and would like to know how much your home is worth, Bernie Alvey will be happy to give you a FREE, NO OBLIGATION market analysis of your home. Bernie Alvey, Senior Listing Agent with Exit Landmark Realty, specializes in listing fine homes in Lusby MD, Prince Frederick MD, St. Leonard MD, Huntintgtown MD and surrounding areas. Whether you are in the market to sell you home contact Bernie Alvey today to sell your home for top dollar! This wetisbe makes things hella easy. I'm quite pleased with the infmaortion in this one. TY!